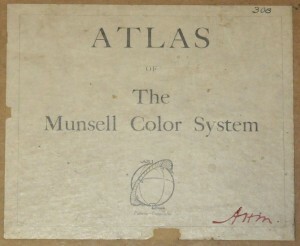 The Atlas of the Munsell Color System was first published in 1913. It consisted of two sets of charts (15 in total), illustrating the Munsell system of color measurement. We have uploaded a PDF of the Atlas from the original first printing – yellowed, worn pages and all. Below is an outline of what the book covers. Index for color notation: hue, value and chroma. Axis of the Color Tree. Value, i.e. the amount of light reflected from pigments, is the second dimension or quality of color. Chromatic Branches of the Color Tree. Chroma, i.e. the strength of pigment colors, is the third dimension of color. Scale of Chromas. Red and Blue-Green Chart. This chart presents a vertical plane passed through the axis of the color solid and bearing the complementary hues, red and blue-green. Scale of Chromas. Yellow and Purple-Blue Chart. This chart presents a vertical plane passed through the axis of the color solid and bearing the complementary hues, yellow and purple-blue. Scale of Chromas. Green and Red-Purple Chart. This chart presents a vertical plane passed through the axis of the color solid and bearing the complementary hues, green and red-purple. Scale of Chromas. Blue and Yellow-Red Chart. This chart presents a vertical plane passed through the axis of the color solid and bearing the complementary hues, blue and yellow-red. Scale of Chromas. Purple and Green-Yellow Chart. This chart presents a vertical plane passed through the axis of the color solid and bearing the complementary hues, purple and green-yellow. Dark Scales of Hue and Chroma, Reflecting 20% of the Incident Light. This chart is a horizontal section through the color solid, similar to chart 50 except that the shorter radii describe a loss of chroma as colors darken. Dark Value Scales of Hue and Chroma. This chart is a horizontal section through the color solid, similar to that of chart 50 except all its colors reflect 30% of the incident light. Scales of Hue and Chroma, Reflecting 40% of the Incident Light. This chart is a horizontal section through the color solid, similar to chart 50 except that all its colors reflect 10% less light. Middle Value Scales of Hue and Chroma. This chart is a horizontal section through the color solid, classifying all colors of Middle Value, by measured scales of Hue and Chroma. Scales of Hue and Chroma Reflecting 60% of the Incident Light. This chart is a horizontal section through the color solid, similar to chart 50 except that all its colors reflect 10% more light. Light Value Scales of Hue and Chroma. This chart is a horizontal section through the color solid, similar to chart 50 except that all its colors reflect 70% of the incident light. Light Scales of Hue and Chroma, Reflecting 80% of the Incident Light. This chart is a horizontal section through the color solid, similar to chart 50 except that the relative chromas change as their hues approximate to white. The Atlas was re-published in 1929 as The Munsell Book of Color which still bears that name today. Are use using these color charts in your work? If so, we would love to hear about it.